a city in and the capital of Moselle, in NE France: fortress; battles 1870, 1918, 1940, 1944. METZ are a Canadian punk/noise rock band from Ontario, formed in Ottawa and based in Toronto. The band consists of guitarist and vocalist Alex Edkins, bassist Chris Slorach, and drummer Hayden Menzies. Formed in 2008, the Metz are currently signed to Sub Pop records and Strange Peace is their third studio album. Strange Peace was recorded with Steve Albini at the helm, so you can pretty much guarantee that this is going to be a noise fest, it isn’t going to be an easy listen, and someone is probably going to get a bloody nose at some point. 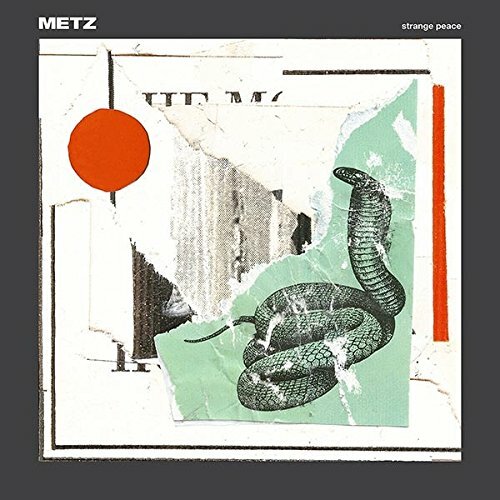 Warning, Strange Peace by Metz might make you think for yourself and turn off that reality TV show crap. The images used to make a collage, all torn roughly to give it an uneven feel, and a cobra being prominently featured should be warning enough that this album isn’t for the great unwashed. You’re not going to head into your local Pizza Hut and find this on in the background, although it might come drifting from the kitchen. You’re not going to find this in somebody’s music collection, sitting snuggly next to the latest Harry Styles record – it isn’t for everyone. Because of this, Strange Peace feels like it’s on constant attack mode. From the beginning when they are informed by Mr Albini that the tape is rolling, Edkins, Slorach, and Menzies make a swirling vortex of noise with the hypnotic “Mess of Wires”, a song which feels like a punch in the gut each time it’s on. It’s quickly followed by “Drained Lake”, which could either be a rebuke of the activities of his Orangeness, Donald Drumpf or about a local punk scene, it really could be anything. As we delve further into the 3rd Metz album though, a few cracks in the wall of sound start to emerge. As strong as tracks like “Mess of Wires”, “Drained Lake”, and “Common Trash” sound, there are other tracks which have little impact or presence, such as “Escalator Teeth” and the atmospheric, but rather still “Caterpillar”. There’s just one direction with Metz, either full out attack or sort of meandering weirdness and nothing in-between. This leads to an album that feels incomplete and empty in place, but that is by design and it is also part of the charm. Like many artists who have been produced by Steve Albini, this record is for the few and not the many. There will not be a casual fan of Strange Peace, it isn’t an album to relax to with a glass of wine and a book in front of a warm fire. It’s a spikey little number designed to hurt you, to make you uncomfortable and it’s delivered in a one-track style. I admire Metz for their determination, for the audacity and style, but I also know a one trick pony when I hear it. Strange Peace sadly lacks the fire of other noise acts such as Whores and Pissed Jeans, but this is not to say it is an awful album. It’s good for what it is, and when Metz are on point, they sound unstoppable. But when they are not playing to their strength, Metz sadly loses a step or two and the album is top heavy with numbers which I keep skipping upon repeated listens. Hopefully they will prove me wrong, I really want them to do so, as they have some great songs on this album. If you listen to “Drained Lake” and “Mess of Wires” and not want to jump around, then I think you’re dead inside. I wanted to love everything on Strange Peace, but sadly only a decent album and not a great record.